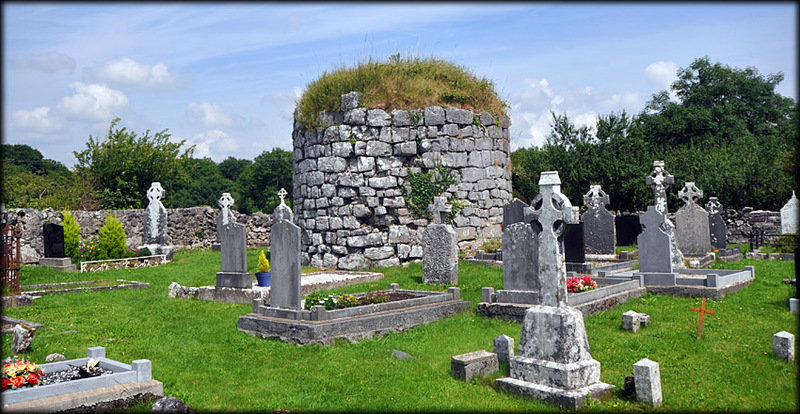 All that remains of the round tower at Killinaboy is a 3.6 metre high stub. No architectural features have survived. The tower was constructed of very unevenly laid limestone and is really quite disappointing. Damage to the southern side of the tower is attributed to Cromwellian forces in the 17th century. But don't let all this put you off visiting this fabulous site. There is a medieval church with a rather unusual but wonderful Cross of Lorraine built into the west gable of the church and a superb sheela-na-gig situated above the south doorway. Situated: From Corofin travel north on the R476 for 3.5 kilometres. 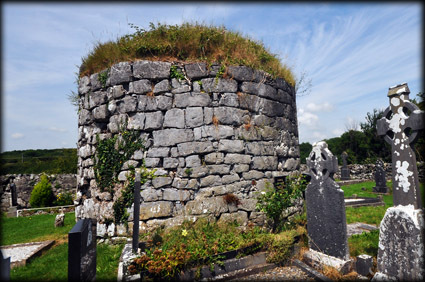 The round tower is to the left of Killinaboy church. Discovery Map 51: R 2708 9162. Last visit July 2014.